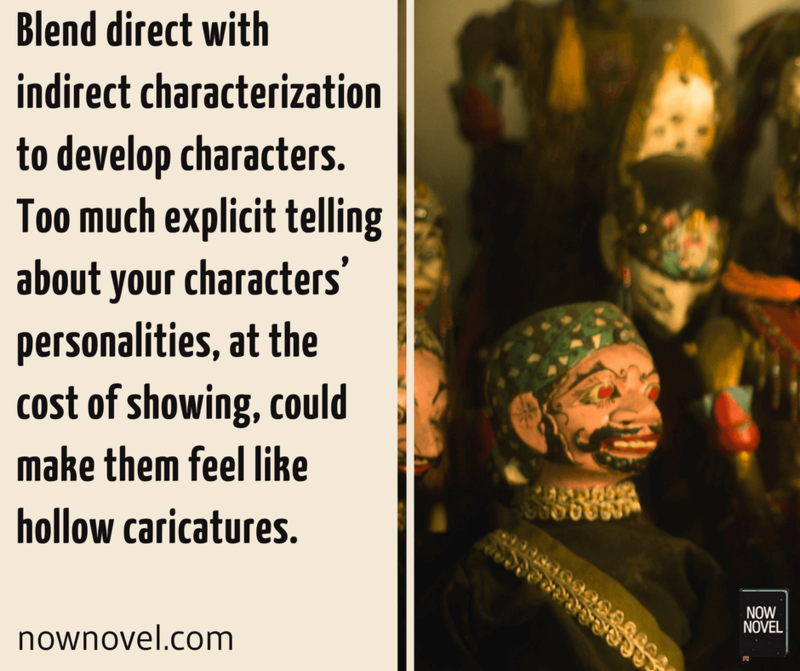 ‘Direct characterization’ means the character details authors explicitly describe. For example, telling the reader a character’s desires, life philosophy or current emotional state explicitly. ‘Looking up, there he was – Mr. Ramsay – advancing towards them, swinging, careless, oblivious, remote. A bit of a hypocrite? she repeated. Oh no – the most sincere of men, the truest (here he was), the best; but, looking down, she thought, he is absorbed in himself, he is tyrannical, he is unjust…’ (p. 52). This is direct – Woolf describes Mr. Ramsay’s traits directly – his self-absorption and so forth. Here, John Steinbeck in The Grapes of Wrath shows a character’s personality indirectly. He doesn’t say that hitchhiker Joad is a down-and-out, blue-collar worker. Instead, the indirect characterization uses the props a worker in the context would have – whiskey, cigarettes, calloused hands – to show Joad’s character. In Dickens’ novel, wealthy Mr Bounderby constantly tells others about his impoverished background and what a self-made man he is. This direct characterization (his theatrically indifferent way of throwing on his hat) suggests his haste, his being ‘a busy man with important things to do’. Its thus fits his persona and backstory. This doesn’t give us specifics: How does he look, because of these qualities? What is it this man fears? Doctorow uses direct characterization to show MYB’s melancholic nature. As we read on, we learn MYB is in love with a famous chorus girl, Evelyn Nesbit. Doctorow passes into indirect characterization, describing the posters of Evelyn on the wall in MYB’s bedroom and his stalking of her to illustrate the extent of his obsessive nature. This movement – from simple, direct characterization to broader character details given indirectly – creates a sense of character development. The direct characterization – MYB’s loneliness – is also relevant to his broader arc. Because he eventually has a brief (but unsatisfying fling) with Evelyn. 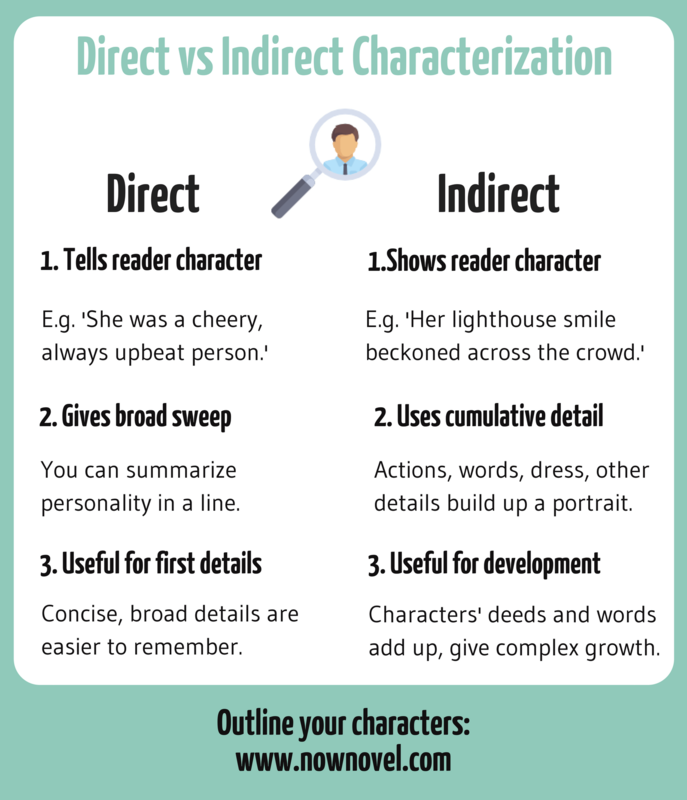 Effective direct characterization helps us picture characters’ appearances and know their primary goals, drives, and motivations. Some physical description is important, especially on first introduction. Yet the best physical description often tells us something about the character’s personality, too. And even links to their story arc, as MYB’s ‘lonely’ nature in Ragtime does. The description of Tom Joad is fitting. We see how lined his face is for a man entering his thirties, and the calluses on his fingers attest to a life of hard work. His aged appearance makes more sense when we later discover Tom’s just been released from prison. This small bit of direct clothing description shows us preteen girls who are discovering their independence. Atwood uses these specific details to convey a strong sense of this age, as the girls become more independent and try appear more ‘grown up.’ These details make the characters’ age believable. Clothing – what does it say about your character? Is their clothing sober, funky, revealing? 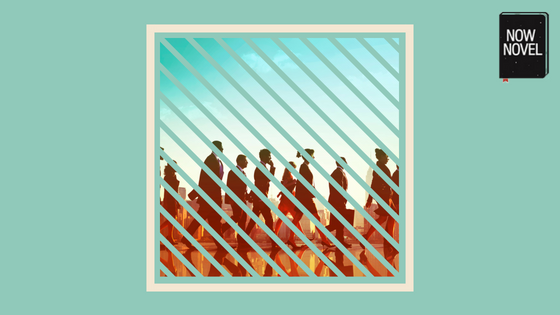 Identity – does your character identify with a particular subculture (e.g. Punk)? What does this say about them? Don’t holler at me like that. Hi, Mitch. but manages to catch it: then she laughs breathlessly. Williams does not need to tell us that Stanley is not a big talker and is a rough type. Indirect characterization here does that for him. This first exchange between Stanley and Stella shows (in his short, barked answers) that he is a man of few words and some aggression. The fact Stella engages in pleasantries with Stanley’s friend (‘Hi, Mitch’) creates stark contrast to Stanley’s limited focus: Meat and going bowling. Even though the stage direction says the characters should appear from different backgrounds, the indirect characterization in Williams’ dialogue already shows us how starkly different they are. Although Tennessee Williams could have a narrator at the start of his play saying ‘Stanley is an aggressive male chauvinist’, it would be odd. It would also pre-determine how we read him. Half the joy of reading is discovering the characters. There’s more excitement and intrigue in learning about characters by degrees. This passive ‘just sitting there’ suggests Janie’s despondent feelings. A build up of images of waiting and stasis describe Janie indirectly. They reveal her gradual realization that she doesn’t love Killicks. Here, indirect characterization details build up to a major character development. The characterization explains the approaching change in Janie’s path. One way of thinking of direct characterization vs indirect characterization is to think of cause and effect. For example, the direct characterization of Mother’s Younger Brother in Ragtime (he is ‘lonely’) leads to the longer arc of his actions (stalking a famous chorus girl). Similarly, when we first meet the fraudulent Mr. Bounderby in Charles Dickens’ Hard Times, Dickens shows as directly how exaggerated everything Bounderby says and does is. Through indirect characterization, through Bounderby’s accumulated words and actions, we understand the the reasons underlying his pompous behaviour. Everything from character dialogue and actions to the words you choose to describe settings can deepen characterization. For example, two different characters could describe the same setting completely differently. The way each describes this setting would reveal key differences about them. For example, imagine two siblings, John and Sarah, decide to investigate a mysterious abandoned house on their street. Sarah’s observations show us the character isn’t at the mercy of her imagination like John. We get a sense of an independent character who won’t be swayed by popular opinion (‘people say’). The terse ‘any idiot’ indirectly shows Sarah’s character. She comes across as matter-of-fact, and maybe even a little closed-minded and judgmental. Create believable, developed characters. Join Now Novel for constructive feedback as well as tools to develop and profile your characters.